Salvia perennials and shrubs that bloom year after year save you money and effort in the garden. Selecting ones appropriate for your area's USDA Plant Hardiness Zone increases the chance of repeat performance. When gardeners speak of hardiness, most often they are referring to the ability of a plant's roots to survive winter cold and grow anew. USDA hardiness zones consider only winter temperatures and are applied to the selection of perennials and shrubs appropriate based on cold tolerance. The USDA separates America into 13 hardiness zones based on average annual minimum temperatures. Each zone is identified by a 10-degree minimum temperature increment. For example, USDA's data shows that winter temperatures in zone 7 generally bottom out from 10 to 0 degrees F and that zone 8's low point averages from 20 down to 10 degrees F.
Each zone is further divided into two subzones with each representing half of a zone's minimum range. So, zone 7a has a tendency to sink five degrees colder than 7b. 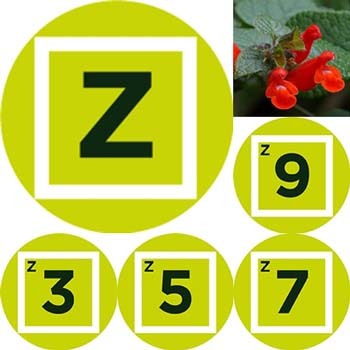 At Flowers by the Sea, we don't label our plants by subzones, because many factors affect a sage's success -- such as microclimates and beneficial placement in a yard -- and some may be more important than a difference of 5 degrees. The USDA Agricultural Research Service sets zone temperature boundaries based on decades of historical data from all parts of the U.S. It presents this information in an interactive digital USDA Plant Hardiness Zone Map, which is color-coded to show where the zones occur. The site also offers a search box for finding zones based on zip codes. For example, zone 1a (parts of Alaska) is represented by pale lavender and is -60 degrees F, whereas red-orange indicates zone 13b (Puerto Rico) where the winter low is 65 degrees F.
How far north or south you live doesn't necessarily predict your zone. For example, Tampa in central Florida and much of the southern tip of Texas are both classified as zone 9b. This is also the zone for most of Washington state's Olympic Peninsula. Many characteristics of climate -- including local rainfall and summer heat -- affect plant survival. Factors such as soil chemistry (acidity versus alkalinity) and texture (from hard-packed clay to loose gravel) also can predict success or failure for a plant. So please keep in mind that a plant classified for zone 9b may not grow well in all areas identified as 9b. You need to consider all its needs, which are described on the Cultural Icons page of each plant description in the FBTS online catalog. Just because a sage won't withstand winter in your climate doesn't mean you can't grow it. Many types of Salvia that are perennial to zones with moderate climates are excellent annuals in areas with chilly winters. In the moderate climate of our coastal Northern California farm, Flowers by the Sea grows sages ranging from a few choices for zone 3 to many choices for winter survival in zone 5 and beyond. Each plant description in our catalog identifies the plant's hardiness zones. You'll find this information in the list of details on the opening page of the description and on the Cultural Icons page. If you have more questions about finding the right sages for your local growing conditions, please call or send us an email. We want to help you get a successful start.